I’m using the Omron HBF-500 Body Composition Monitor with Scale to track my weight, body fat, visceral fat, skeletal muscle, resting metabolism, and BMI. I really like the scale and I’m happy I bought it. 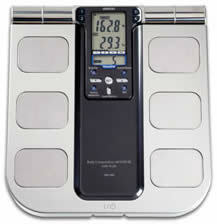 If you aren’t tracking your body fat at all right now, I recommend you buy this or a similar scale that tracks body fat. There are less expensive options if you already own a scale and just need a way to track your body fat, such as the Omron HBF-306C Fat Loss Monitor (recommended by Lazy Man from Lazy Man & Health). *Note – You need to be between 18 – 80 years old and between 3’4″ to 6′ 6-3/4″ tall for this scale to work for you. The Omron HBF-500 Body Composition Monitor with Scale is about the size of a typical bathroom scale, but with a little more weight and bulk (hey, just like me!). With a multitude of buttons and a complicated digital display it looks quite a bit more advanced than the average bathroom scale, but don’t let that scare you–it is very easy to use once you get familiar with it. 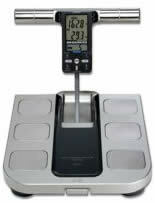 You need to spend a few minutes configuring the scale before using it the first time. The first step is to set the date and time because the scale stores up to 90 days of results. Next, you enter some personal information so the scale can track your statistics. This can be done for up to 4 people, and if you don’t want to store data or if you have used up all 4 spots, anyone can use the scale by selecting a ‘guest’ profile. You can also delete profiles and create new ones at any time. Once you’ve stored a profile, using the scale is fairly simple, although you need to pay attention to the order of operations in order to get correct measurements. Before stepping on the scale, turn it on with a large button on the back. The display flashes and changes to 0.00 when ready. After the display shows 0.00, and before you step on the scale, lift the display unit out of the scale (the small T-shaped thing) and hold handles firmly. Select your profile number and, finally, step on the scale. 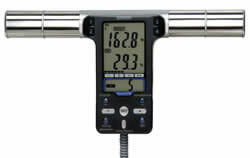 Wait a few seconds for the display to show your weight and begin to flash ‘START’. Then, raise your arms up to a 90 degree angle while holding the display (this all sounds a lot more complicated than it really is). The scale rates your results in each category, based on your age and gender, with 4 classification symbols “-, 0, +, ++” (0 is normal). And these are saved for 90 days, so don’t worry about remembering everything each time you weigh in. If you want to quickly check your weight without all this rigmarole, just turn the scale on, wait for 0.00 to display, and step on without grabbing the display unit. You don’t need to select a profile and your weight won’t be saved. The instruction book is very informative on its own. Take some time to read it, because it describes what each category is, why it matters, and what range you should be in. For example, I had never heard of visceral fat before (it’s fat that surrounds internal organs). Turns out, too much visceral fat leads to high cholesterol, cardiovascular disease, and diabetes. There is some debate over how accurate this form of body fat measurement is, but, unless you’re entering some sort of competition, all that matter is establishing a baseline for tracking your progress. For myself, I was never going to go see a personal trainer or other professional to get my body fat measured, so this scale provides an easy to use body fat measurement at home that I can do any time (this is extra important when you don’t feel too proud of your body in its current shape). I paid about $65 for the scale at Amazon.com. You may not want to spend that much money on a scale, but I would encourage you to get something, anything that allows you to measure your body fat. Omron also makes a handheld fat loss monitor for about $27 , which makes sense if you already own a scale and want to save a little money. Or, if you don’t already own a good scale, just spend a little extra andget the Omron HBF-500 Body Composition Monitor with Scale so you can establish a baseline and track your progress over time.